The awards for the best presentations given by a young scientist at the International Conference on Computer Vision and Graphics ICCVG'2018, Warsaw, September 17-19, 2018, funded by the Association for image Processing have been granted as follows. The winning presentations have been selected by the body consisting of Programme Committee members and members of TPO Governing Board present at the Conference, from the papers of the best scientific merit, on the basis of the quality of the paper and the quality of the presentation. The award is granted to the person who presents the paper. The award comprises the right of partipating in the next ICCVG with zero fee, and a diploma. The distinction consists of a diploma. The awards have been handed over to the prize-winners during the closing of the Conference on September 19, 2018. The awards for the best presentations given by a young scientist at the International Conference on Computer Vision and Graphics ICCVG'2016, Warsaw, September 19-21, 2016, funded by the Association for image Processing have been granted as follows. The award comprises the right of partipating in the next ICCVG with zero fee, and a diploma. The distinction consists of a diploma. The awards have been handed over to the prize-winners during the closing of the Conference on September 21, 2016. The awards for the best presentations given by a young scientist at the International Conference on Computer Vision and Graphics ICCVG'2014, Warsaw, September 15-17, 2014, funded by the Association for image Processing have been granted as follows. It is our pleasure to announce that Special Prizes for the laureates of the awards for the best presentation have been funded by WOLFRAM. These are the instances of the WOLFRAM MATHEMATICA computing system. The winning presentations have been selected by the body consisting of Programme Committee members and members of TPO Governing Board present at the Conference, from the papers of the best scientific merit submitted to the Special Session for Young Scientists, on the basis of the quality of the paper and the quality of the presentation. The awards consist of a selected, recently published monograph on computer graphics or computer vision, respectively, and a diploma. The distinctions consist of a diploma. The awards and distinctions have been handed over to the prize-winners after the concert held for the Participants of the Conference on Spetember 22, 2004. See the detailed regulations of the competition. 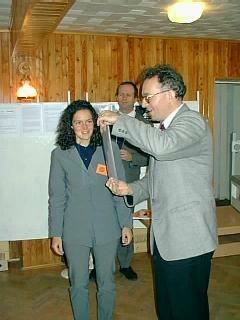 The awards and distinctions for the best presentations at the International Conference on Computer Vision and Graphics ICCVG'2002, Zakopane, September 25-29, 2002, funded by the Association for image Processing, have been granted to the persons who presented the papers. The winning presentations have been selected by the body consisting of Programme Committee members and members of TPO Governing Board present at the Conference, from the papers of the best scientific merit submitted to the Conference, on the basis of the quality of presentation of the paper. The awards consist of a selected, recently published monograph on computer graphics or computer vision, respectively, and a diploma. The distinctions consist of a diploma. Mr Wojciech Palacz is with the Department of Computer Aplication in the Humanities, Institute of Computer Science at the Jagiellonian University, Kraków, Poland. The award consists of a selected, recently published monograph on image processing, and a diploma.. The second author of the paper was Prof. Jos B.T.M. Roerdink from the same Institute. The award amounts to 1200 PLZ. M. El Haziti, H. Cherifi, D. Aboutajdine. Lossless optimization of fractal image coding. R.M. Palenichka, T.P. Belikova, I.B. Ivasenko. Robust extraction of diagnostic features of lesions from medical radiographic images. V. Skala, B.D. Huy. Two new algorithms for line clipping in E2 and their comparison. A. Wojdała, M. Gruszewski, R. Olech. Real-time shadow casting in virtual studio. The Proceedings of the Conference have been published in Machine Graphics & Vision - International Journal, Vol. 9, No. 1/2. Mr Wojciech Tarnawski, M.Sc., Eng. Mr Wojciech Tarnawski is with the Division of Systems and Computer Networks at the Faculty of Electronics, Wrocław University of Technology, Wrocław, Poland. The winning paper has been selected by the members of TPO Governing Board present at the Conference, from the papers nominated by the Chairmen of the Sessions, on the basis of the scientific merit and quality of presentation of the paper. The award amounts to 700 PLZ. The author of the idea and the main organizer is Professor Marek Kurzyński. The information on this Confernce is available at http://www.zssk.pwr.wroc.pl/zssk/kosyr/kosyr.html. Dla wszystkich członków zwyczajnych i wspierających TPO zamówiono subskrypcję Machine Graphics & Vision na rok 1998. Ponieważ wydawca nie dysponuje już numerem 1-2/98, subskrypcja zaczyna się od numeru 3/98. Ta subskrypcja, ufundowana przez TPO, nie dotyczy członków zawieszonych (decyzja V Walnego Zebrania). All the full and supporting members of the TPO have been subscribed to Machine Graphics & Vision for 1998. Because the editor is short of number 1-2/98, the subscription starts from the number 3/98. This subscription, founded by the TPO, does not apply to the suspended members (decision of the 5th General Meeting). the Ph.D. student at the Dipartimento di Elettronica, Informatica e Sistemistica, Universita di Bologna, Italy. The second author of the paper was Prof. Dario Maio from the DEIS - Universita di Bologna. The winning paper has been selected by the body consisting of Programme Committee members and members of TPO Governing Board present at the Conference, on the basis of the quality of presentation of the paper. The award amounts to 1000 PLZ. M. Bartkowiak, M. Domański: An efficient technique for high-compression of chrominance data. A. E. Hassanien, M. Nakajima: An efficient cross-dissolve transformation with elastic body spline warping interpolation for facial image morphing. A. Wojdała, M. Gruszewski, K. Dudkiewicz, M. Donotek: Real-time depth-of-field algorithm for Virtual Studio. The Proceedings of the Conference have been published in Machine Graphics & Vision - International Journal, Vol. 7, No. 1/2.